Well, I've decided to give up playing my bass. Practicing was feeling more like a chore than an enjoyable hobby, and I would really prefer to spend my time on a hobby that I look forward to without dread. This just confirmed my belief that my Hot Sister got all the instrumental talent in the family. 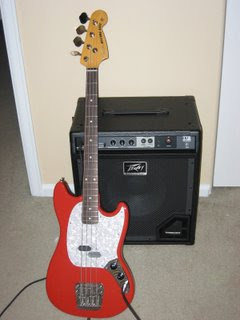 But now I have a beautiful Fender Mustang Bass and a Peavey Max 112 in need of a home. I've posted an ad on Craigslist, but with the economy in the crapper and several other Mustangs for sale in my area, I'm not sure how quickly it'll sell. I really need less expensive hobbies, so when I decide to be fickle the cost of the equipment isn't an issue. But I'm not going to hold my breath. I'm considering going back to vocal music, but I'm pretty picky about what groups I would want to sing with. I'm not against singing liturgical music, but I won't sing in a church choir for any reason. Mostly because it's hard to sing when you have vomit in your mouth from your own hypocrisy. Oi, Janiece--I'm sorry it didn't work out. I wish I had an encouraging suggestion that would help you stick with it, but if making music isn't a joy, well, that sort of defeats the point. But would a different teacher help? Just jamming a little more or working some improv into your practice sessions? I dunno. Just trying to help. It's okay, Eric - I was trying to broaden my musical horizons, and it just didn't work out. My only disappointment was that the experiment cost so much. I understand about expensive hobbies. I took kendo for a year and all the equipment ended up costing a lot and then Logan came along and suddenly I found that I had no time. Kudos for trying though! I have no musical talent, and would (probably) never try to pick up a guitar to learn how to play. She who dies with the biggest stash WINS!! Which brings this to mind, for some reason. My most famous almost-failed-but-still-not-successful experiment rang up at a little over $4K, and it's not even a hobby :( Not to make light of your costs, just sayin' it's not as bad as it could have been. And like Eric said, if there's no joy in it, then, well, there's no joy in it. I do like Monty Python, although I cannot quote it the way some people around here can (cough*Michelle*cough). But "being a bit strange" and "Monty Python" aren't exactly mutually exclusive. Heh. I really enjoy MP and had never heard that song. The lovely part of it is that it's so true (if you believe in God, that is). Theists like to emphasize that God made beautiful things, but if He did, then He certainly made all the ugly and distateful things too. Which makes for a pleasingly (to me at least) diverse world. Yep, if you're not willing to play until your fingers go numb or bleed, you're just not into it, said the person who is somewhat glad to no longer have smooth pad hands from the calluses (but man I miss being able to play like I used to). There's plenty of things to do in the world, and not enough time to spend doing things you don't like as much.